Snowdon is the largest mountain in the territory of Wales (Wales). It is located in National Park Snowdonia. This protected natural area is located in the northern zone of the area, and is considered the first of three national parks on the territory of Wales. Established in 1951 the name of the park is generally translated as "high mountain terrain." The peak Snowdon is the highest point in Wales and rises to 1085 m altitude. With its size, it ranks second in size across the UK after Ben Nevis. Snowdon has several points which together form the shape of a horseshoe. National Park Snowdonia was created to protect the unique and beautiful scenery in these places. 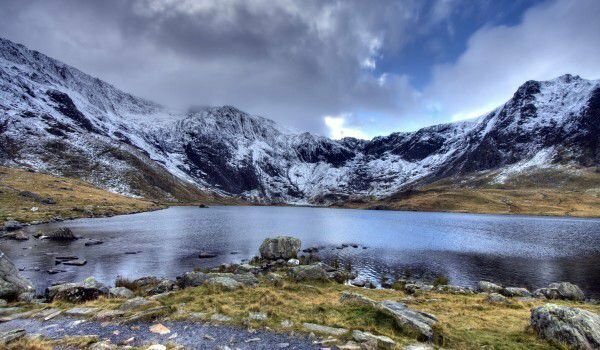 Undoubtedly the highest peak is the largest tourist attraction, as thousands of tourists a year come here to conquer Snowdon or just walk around the picturesque region. Almost all year around the top has a thick cloud of hanging fog. For those who have decided to climb above, it is recommended prior to follow weather forecasts and see if there will be rainfall that might impede their march. There are six main tourist routes to the summit. Most of them do not take more than five hours climbing. For visitors who do not care for mountain climbing, the peak has an alternative. A railroad, departs from Llanberis and reaches the highest area of Snowdon. The entire park is spreads about 2170 square kilometers, from north to south it is 80 km and fom the east to west, it reaches 56 km. The region is dotted by beautiful streams and rivers that are perfect for lovers of rafting. For tourists there are conditions for pleasant riding among woodlands and riverside walks. Snowdonia is a paradise for those who love mountain biking. There are different marked routes, both in territory and in difficulty. If you do not want to sleep in a tent in one of the pleasant meadows here, in the vicinity of the park are some beautiful towns and villages where you will find no problem finding where to sleep.